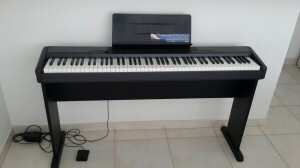 Over the years we’ve had experiences with different types, used digital pianos and new ones, made by most of the big manufacturers like Yamaha, Casio, Roland, Kawai and others. If you’re just starting to learn how to play the piano and many ads featuring used digital pianos seem attractive, you might want to consider some things before making a rushed purchase. You might think that a used digital piano will be enough for you, but think again. Yes, there are many different models to choose from, but only few are worthwhile your investment. Some have useful technology and are in a good condition, but most of them are inevitably outdated as far as piano sound and key action is concerned. On top of this, some might also have a certain degree of internal wear, which is not detectable at first sight. A common misconception is that you could get a fair value for a deeply reduced price. The thing with digital pianos is that as technology develops more and more every year, big manufacturers have the ability to release new models that feature highly improved technology, many times at lower prices than used models. For example, a digital piano that might have cost $2000 a few years ago, which could well have been one of the better models sound-wise, has now been replaced by brand new models with 3 -4 times better technology and roughly half the price. Even if the one model you’re eyeing might be fairly priced and might not show any physical damage, it also might not be the best investment that you could possibly make. Looking at the aspect of quality, new digital pianos released by the best manufacturers are now closer than ever to duplicating the exact key action and sound of acoustic grand pianos. 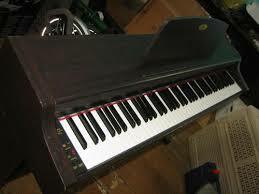 We often get asked the question: “Is it worthwhile buying a slightly used digital piano?”. The truth is it really depends on what you’re prepared to be content with. If you want the best you can get (of course, at a price within reason) for you or for your children, then the answer is always to pick one of the top new digital pianos. Quality and price-wise it’s the number 1 best choice that you can make. If you or your child is just starting to learn how to play the piano, you might not feel a big difference between a used and new digital piano, but new and improved technology can go a big way towards rendering a more authentic and truthful experience of playing the piano. If you think you could benefit from the latest in music education, than a newer model will almost always prove to be a better choice. Most (not all) new digital pianos have high speed USB transfer capability, which means you can hook it up to your iPad or laptop and take advantage of the latest applications that help you learn to play the piano much easier and more intuitively. Most piano teachers nowadays rely on modern software that makes a difference in the learning process for both children and adults. Do older models have the same capabilities? Yes and no. Most don’t, and the greater part of those that have connection capabilities rely on MIDI which is not quite the high speed USB transfer ability that many of the newer models have. You and your children deserve to have access to the most fun and exciting educational software that exists nowadays. There are many questions that you should ask before deciding to purchase a certain used digital piano. First and foremost you should think exactly what you need the piano for, what it has to be capable of doing in order to comply with your needs. For example, you should know how much polyphony piano sound memory a certain model has and if that makes any difference for you. You should also find out information about the pedals, if it has pedals, if the pedals support half-pedaling for more realistic pedal action and of course, if that matters to you. Another thing that you should make sure to find out is if the piano you intend to purchase has connectivity capabilities with devices such as tablets or laptops. A model that is capable of transferring data to and from a laptop, for example, will make a big difference regardless if you’re just beginning or are a more advanced pianist. You should also check out how the keys work, and if nothing’s damaged under them, where they make contact. Any weird key action is a big sign to walk away from the purchase as it will only give you headaches further down the road. An important aspect that you should take into consideration when looking at used pianos is the fact that they are usually featured in private ads, and they don’t include any kind of warranty. Now, that shouldn’t be a problem if it’s a high reputation brand, right? Wrong, because there are so many problems that could be present in any given used piano that chances are you might buy one and never know about hidden problems that are hard to detect. The price difference that might be a motivator in your decision to buy a used one could go right into repair. Actually, you could end up spending more on repair than the actual cost if a digital piano technician is nowhere in your area. Many people who have found themselves in this situation had also the surprise to find out that parts are hard to get for certain models, or worse, not in production anymore. Digital pianos do have the tendency to wear out after a period of time (which is longer or shorter depending on the model), so if you think about buying a used one, you should be totally aware of all the risks associated with them. Even if they look good on the outside, there could be so many things broken on the inside that it’s safe t recommend to avoid such a purchase. One of the major problems with used digital pianos for sale on the market is that most of the times, their owners think they’re worth a lot more than they actually are in reality. In fact, you can find new pianos by big brand manufacturers that are ages more advanced in sound and key action that older, 5-6 years old models. You can actually find some high quality new digital pianos under $1000, making the purchase of a used and more expensive model an option to be forgotten. Although some stores offer free bonuses with their used digital pianos, those bonuses can’t and don’t make up for the risk. It’s ultimately up to you which choice you make for yourself or for your loved ones, but with so many new models on the market, at competitive prices, it’s just natural to go for a new one. If you don’t know exactly which model to choose, you can find some help by reading our guide on finding the best digital piano, or browsing our reviews.